I started the morning in the Dealers Room as usual but made the stay short as the Brilliant Gameologists had invited me co-host their panel “On the Critical Analysis of Games”. The Panel probably had about 15 attendees, which was just about the right size for our interactive format. We proposed at the beginning that we were looking to collectively build a system for rating RPGs just like board games or literature is rated, based on components that can be individually evaluated. We proposed the following metrics (I hope I have them in order): Art, Writing, Setting, Mechanics, Objective and Rewards, with the hidden seventh element synergy between the previous six. Robin’s Laws vs Play Dirty Death Match! This “Deathmatch” was one I had been looking forward to for months since John Wick posted a teaser on his LiveJournal. The panel followed a pretty standard format of advice for GMs, most of which I had heard from either John or Robin before via some medium or another. What was really intriguing to me was watching how their strategies compared side by side. John, for instance, would often offer a suggestion that would blow the mind of the players. “We attacked the army of orcs and got captured? And now one of us is sent back to the king with ransom demands lest the rest of us be cooked on a spit?” His philosophy (or my understanding of it) is that he wants to play a game where the characters aren’t protected by their powers. He wants tense situations where the players are forced to scramble and try desperate acts to try and overcome challenges with no simple solutions. Consequently he also wants players to exceed their characters. Sure, you’re a superhero who can lift a building, but how can you handle being in jail? Being betrayed? The theme here is challenge. Beat the players with a hammer and you’ll forge iron into steel. Robin on the other hand focuses on the social contract of the group (even if he didn’t use those words). In the same situation he would stop play (I know… the taboo!) and talk to the players explaining that he didn’t think they shared the same perception of the situation as he did and ask what their expectation was, because what they were proposing sounded to him like a suicidal course of action. I think this kernel of wisdom in understanding expectations is implicit to every “intent-based” resolution system, but ultimately needs to be applied in some way (either through mechanics or by coming to a common understanding in the group) to every game. I’ve got some notes I took during the panel which unfortunately are still mixed in the deluge of swag I took back from the con. When I pull them out, if there is anything I missed I’ll put it in the comments. Right out of the Deathmatch, bloody and beaten, I stumbled into Luke Crane’s lightning round of independent game creation . He had four hours of material and one hour to do it in. Luckily Luke talks very fast! Notice a pattern. Actually there is a lot more to it, each playtest phase yields different results. He also talked about his personal process for creating Burning Wheel, dealing with editors, artists, etc and encouraged anyone tackling layout to just pony up and learn InDesign. The panel was rushed (on account of there being so much content) but I got a valuable framework for designing 15 Minutes, that I am pretty excited to put through its paces. GenCon was crazy busy for me. With all the highs and lows I barely ever slept. I also didn’t eat with any kind of regularity. Add that to constant exposure to stimulus and it isn’t surprising I crashed. I started wishing I could put the con on hold, go home and process stuff and then pick back up where I left off. Alas stopping time is one convenience not afforded by my vast array of super powers. So instead I just checked out for a bit. Zach and Justin were in the Games on Demand room playing Shock, which from their description was awesome. Just a few words: Government Regulated Mathematics! I tweeted a bit and got great support from folks Chris Hanrahan, Kristin Hayworth, Wilson Zorn, BG_Meg and JBMannon. Thanks guys. Then I meandered the Dealer Room, kind of in a haze. I looked at all the excitement and energy game developers have about their games and wondered “will I ever be that exited about anything I create?” I’ve wanted to be. And I’ve been really excited about creating props or writing a good adventure, or running successful games, but I started fearing that (a line I stole from Paul Tevis) I want to have written a game more than I actually want to write a game. Somewhat somber? Yes, but I think moments of looking back and asking what this means to you is a critical component of being human. After some thought, it is what I want to do, and somehow or other I’ll make it work. I kicked myself back in the saddle and decided to play some more games. Hot dog from the dealers room in hand… man… think on that for a sec.. the dealers room was so big it had a hot dog stand in the middle of it. Anyway, fed and ready to play I stopped by the Dragon Dice booth and did a demo. Dragon dice, a game who’s history interests me more than the product itself. The Dragon Dice game that died about a decade ago is back. The guy doing the demo said the had some internal issues but were back on track now. Interestingly I think the market has really taken a full swing during that time. When they first came out everyone and their mom was making CCGs and the idea of a CDG (collectable Dice game) was both novel and delivered to an audience who was willing to accept the pay now, then pay some more, then keep paying model of play. Then they dispersed and not that long after (coincidentally not causally), the CCG model burnt out. Sure the big guys Magic, L5R, Pokemon, etc stuck around. But gone were the days of Jyhad, Wyvern, and Overpower along with the dozens (if not hundreds) of others in their ilk. Now, actually more than a decade later, people are starting get more comfortable again with CCGs. The World of Warcraft card game rewards players with cool prizes inside the MMO and has a much lower barrier to entry. Other non-collectable card games like Battlegrounds, Dominion and the rash of Steve Jackson games have also softened our palette again, making the occasional collectable model seem acceptable. And with this less bitter market Dragon Dice are back. It’s still the same game (so far as I can tell) but they’ve nuanced the battlefield somewhat to allow for more options assigning armies and positioning. Personally, it mostly excited me because of the ideas it gave me for our L5R Warfare system, but all on its own, the game has a good premise: Battle each other’s armies. Roll Dice. Use Dragons! They won an origins award back in 1995, I’m really curious to see what Dragon Dice does this time around. And… they gave me a free die for being in the demo. How cool is that? Have you ever heard of Cadwallon? I hadn’t, at least not until Justin told me about his Cadwallon game, which uses a system cobbled together from several games but is set in the Cadwallon world published by Rackham. I pretty much figured this was the only knowledge I’d ever have about the game/setting. So we poked around for a bit and found a demo table where they showed us the game. In brief, each player controls one of the guilds in Cadwollon and use their guild strength to bid for control of powerful artifcats, important individuals and other factions. The game plays one part like a bidding game and one part like a deck construction game (ala Dominion). I wasn’t sold on the game immediately, but I’d play it again. The artwork was beautiful and very evocative, I’d just like to see a bit more interaction between the players. Definitely worth checking out one more time before giving a final review. Eight people have rated it on BGG thus far, giving it average rating of 6.9. Pixie Emissary for the Win! Dealer’s room closed, Zach was itching to serve up some Blood for the Blood God! Skulls for the Skull Throne! He had purchased Chaos in the Old World, punched out all the pieces and was ready to play. We found a table in the Games on Demand room (all the games there were winding down and a bunch of them were open for use). Chaos in the Old World features three ways to win, and gives you an unparalleled opportunity to reshape the world in your image. Every turn you corrupt the landscape, dominating its inhabitants, and battle with the depraved followers of rival gods. Each god has a unique deck of gifts and abilities, and can upgrade their followers into deadly foes. Summon forth living manifestations of Chaos, debased and hidden cultists, and the horrifying greater daemons – beings capable of destroying near everything in their path. Different win conditions mean that different strategies are possible. We’re not all going after the same thing all the time. Our powers meant that sometime we were at each other’s throats, sometimes begrudgingly cohabitating nations and sometimes conspiring together against a common enemy, but we were never playing games of solitaire. Interaction was fun, encouraging (that is to say you usually got more out of trying to get what you want then trying to play it safe) and constant. Each god had cool ways of tweaking the other gods in ways they don’t expect. Add that to the “threat” rating which gives advantages to the player furthest from winning and it makes for some nice balancing elements in the game. 90 minutes. The game is pretty fast. We played a three player game with learning the rules in 90 minutes. Just when some other epic style games (like Age of Renaissance) are starting to drag because they are going on to long, CitOW is ending. As someone whose attention span is limited, I really like shorter games. There is a whole stack of cards called Ruination! How cool is that. Yeah, you really do destroy the world to gain power. Very well conceived. Some of the chaos chards (character powers) are just straight up lame. I’ve had a few where was totally unexcited about playing them. I’d love to see the chaos decks tweaked, eratta’d or modded and then re-released as a (hopefully cheap) expansion. The turn before the last might as well not be played. If one player is really close to winning on the 2nd to last turn there is virtually nothing that can be done to stop them. This makes playing the last turn somewhat of an extraneous act. I’ve only played twice, so it could be that the end is not as sealed as it looks, but the games I’ve been in so far left me asking myself why we played out the last turn. Next stop… Party, Party, Party! If it is any consolation, InDesign is a cakewalk to learn (especially if you have any other Adobe experience) and a hell of lot more intuitive then say QuarkExpress. Do I take this to mean that you may in fact be looking to brush off that wishlist and create your own game? I’m amused that we managed convergence in both getting to play Chaos in the Old World. 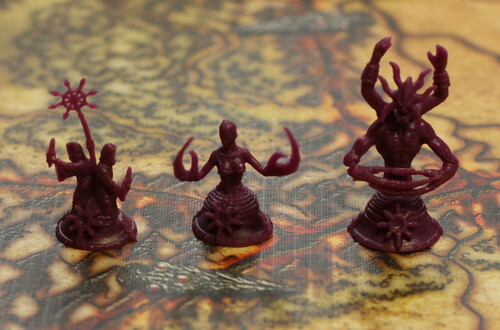 I played Slaanesh simply because he gets the purple pieces. And yes, we had that same 2nd to last turn issue. Even with multiple people about to win, you know the order of operations and can figure out who will win first. The other option is that the last turn becomes a brutal conflict to see which of the 2 players would win.